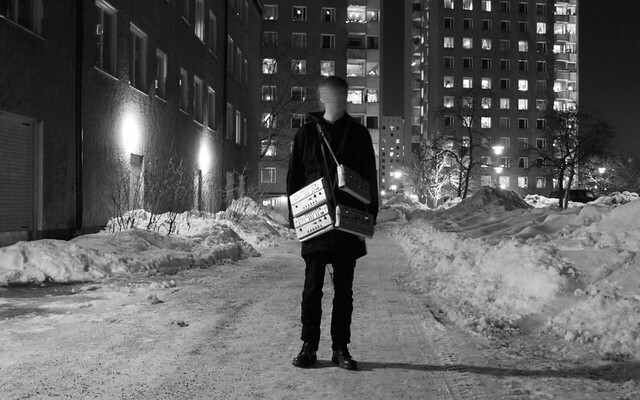 TM404 is a conceptual project imagined by Andreas Tilliander of quality Swedish label Kontra-Musik. The project aims to explore the potential of the classic Roland instruments responsible for so much of dance music past and present: venerated analogue machinery such as the 303 and the 808. According to the press on the Kontra website, Roland never made a ‘404’ due to superstitious executives concerned about similarities between the number four and the Japanese word for death. The naming of the project may also be a nod to the internet 404-error message, where a website is ‘dead’, or the link to it broken. TM404 saw Tilliander carving out fantastically novel, textural electronic dub pieces - recorded in one-take live sessions with no overdubbing; they represent a coming together of techno’s futuristic preoccupations with the historical attention to detail of a passionate archivist. Svreca, owner of ubiquitous spanish label Semantica, is the perfect fit for a remix EP of TM404 – so perfect, in fact, he managed five unique interpretations. The points of connection between Tilliander and Svreca are many: glacial electronic dub with a focus on exploring the gritty textural possibilities of clinical analogue sounds – there is a palpable excitement in Svrecas’ wilful treatment of his sources. Across the EP structure is used as a skeleton on which to hang matter-of-fact polyrhythms & subtle explorations of spatiality: see the way in which B2 rockets off with its propulsive rhythm, then barely changes for the length of the track. In a less skilled producers hand, this technique could become tiresome, but Svreca clearly grasps the mesmerising potential of loop based music – in a sense this is drone-techno, as functional in repetition as it is beguiling. The A-side of the EP clearly deals more with harmonic elements – A1’s subtle acid flutters outlining an enchanting but uneasy sonic space, while A2 feels like six minutes in purgatory’s sauna room - it’s repeated chord motif echoing out to infinity. In comparison the tracks on the B-side offset shifting polyrhythmic elements, with a single tonal centre, against monolithic kicks. This EP contains some of the purest-sounding modern techno: a heady distillation of crucial stylistic touchstones, it reaffirms Svreca as being among the best of those quietly brilliant producers; rarely properly appraised due to his prolific nature. If ‘404’ implies a broken link, then I hope it doesn’t signal the same for this match up: as a partnership it’s a fruitful one and long may it continue.